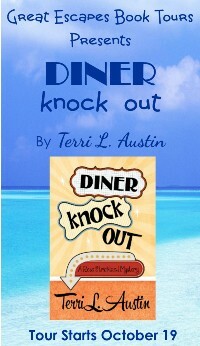 Author Terri L. Austin’s zany, quirky characters and their antics make Diner Knock Out a fun read. With all the twists to keep you on your toes and things you find out this book is wonderful. I think Rose discovered a lot about herself this book, both in how she sees herself and how she relates to others. I like the direction the series is headed. Terri Austin is a master at misdirection, as I danced from one suspect to another. 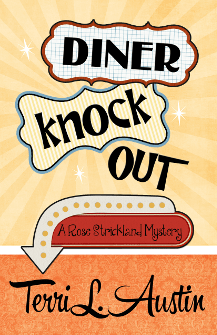 The suspense and mystery kept me reading, questioning and laughing while I worried and fretted over the outcome. This is a Knock Out read! The characters are realistically written and believable. Ms. Austin does a good job developing the mystery; there are plenty of twists and turns, a touch of physical action and the looming threat of danger, which kept me turning the pages to discover what Rose would discover next. Related subjects include: cozy mysteries, women sleuths, murder mystery series, whodunit mysteries (whodunnit), amateur sleuth books, book club recommendations, humorous murder mysteries. As a girl, Terri L. Austin thought she’d outgrow dreaming up stories and creating imaginary friends. Instead, she’s made a career of it. She met her own Prince Charming and together they live in Missouri. She loves to hear from readers. Drop her a note at www.TerriLAustin.com. Twitter, FB, Goodreads, TerriLAustin.com, and Henery Press.